The final ritu al in the celebration is the pulling of the chariots. 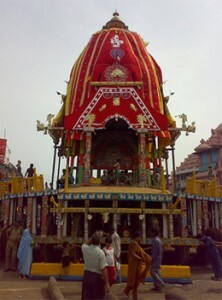 The chariot of Lord Balabhadra is pulled first followed by that of goddess Subhadra. At last the grand moment and the climax of the day’s celebration is reached when the chariot of Lord Jagannatha, Nandighosha starts its spectacular journey to the Gundicha temple. Thousands of devotees who patiently wait the whole day for this blessed moment are ecstatic with joy and pull the chariots with a sense of fulfillment. 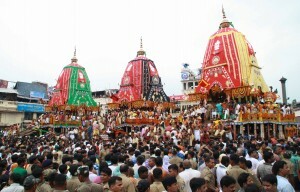 In ancient times, the Ratha Yatra of Puri employed six chariots as compared to the three at present times. A river once flowed between the Gundicha House and the Jagannatha temple. Three chariots stayed in readiness on the other side of the river to receive the deities from the three chariots that transported them from the main temple. There, in their Garden House, adapa mandapa, also k nown as their place of birth, the deities stay for seven days. On the ninth day of the festival, Bahuda Jatra, the grand return journey takes place. On the way back they stop for a short while and partake of poda pitha, a type of cake made of rice, lentils, jaggery and coconut, offered by their aunt, mausima. On reaching back the main temple, the deities, on their chariots, don the golden attire or the suna besa, with hands, arms and crown made of solid gold. 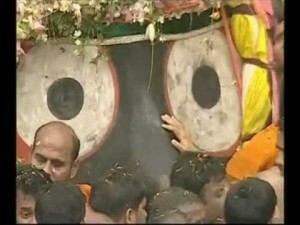 They are also offered sweet drinks, adhara pana, on huge cylindrical earthen pots reaching up to their lips. They are taken down from the chariots in a ritual descent to enter the temple. 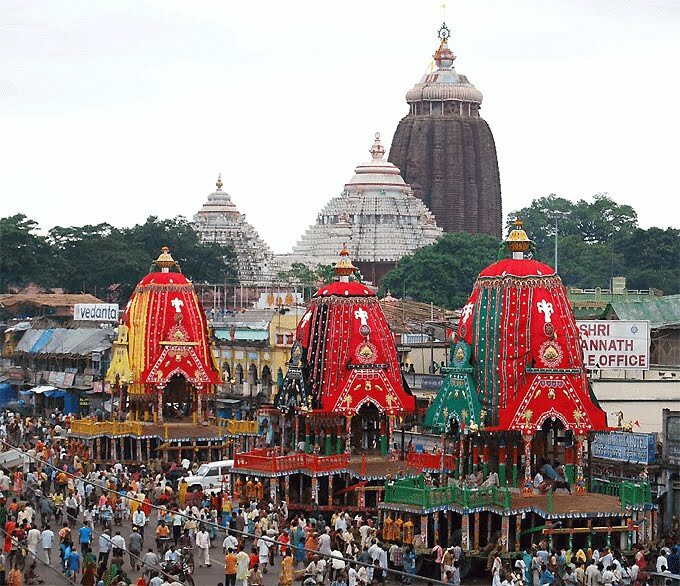 The temple gate is however shut upon Lord Jagannatha by his celestial consort Laxmi. Her anger, jealousy and frustration is articulated by her companions, represented by a group of servitors from inside. Another group representing Lord Jagannatha respond with entreaties and endearments. After re-enacting this drama of daily domestic tiffs of mere mortals, the celestial couple finally make up, and the temple door is opened and the deities return to their bejeweled throne, the ratna sinhasana.